OOOhhh… we love to pARTy at Paper.Scissors.Cake. Art Studio! And we have some some fabulous new packages and add-ons for the New Year! Paper.Scissors.Cake. offers a hip, modern atmosphere to celebrate your child’s special day! We can help you plan everything from beginning to end for the most seamless, stress-free celebration … sit back, enjoy your party, snap pictures; we’ll handle everything! Parties at Paper.Scissors.Cake. 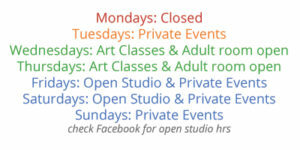 are held on Saturdays from 11 a.m.-12:30 p.m., 2:00-3:30 p.m. and 6:00-7:30 p.m. On Sundays, we host parties at 1 p.m. Call to inquire about weekday parties. You are welcome to bring whatever special touches you wish to make your child’s birthday experience more personal, however, we are a bright, festive studio that normally requires no additional decorating. You supply the dessert or purchase the cupcake bar as an add-on for an even more seamless party. There is an additional clean-up fee for bringing food in other than dessert. Water bottles are OK at no additional charge. There is a $100 deposit due at the time of booking. All deposits are non-refundable. However, you will be refunded 50% if we’re able to book another party in your time slot. Call us at 404-867-1630 to inquire about scheduling and pricing. Please note there is an additional charge for parties with more than 12 guests.